When your next PCS move could take you across the state or across the world, signing a lease without seeing the home is a very real possibility. How do you line up housing while protecting yourself from scams, housing surprises and mis-represented properties? In an ideal world, we would be able to take a trip to our new community to take a look around, decide which neighborhoods are a good fit and check out available homes. The reality of a military family’s PCS doesn’t always allow for that much planning. You may be moving thousands of miles away. Duties at the current unit may not allow for enough leave to make that trip. Orders may come at the last minute, not leaving enough time for planning a house hunting trip. Plus, the military community rental market is competitive enough that when the right house comes along – you want to snap it right up! The key is to protect yourself so that squaring away your housing ahead of time reduces the stress of your move instead of increasing it. You’ve found a home that looks perfect. But you won’t be able to make an in person visit before signing the lease. Your next step? Asking plenty of questions. There are some things that pictures can’t tell you. How much traffic noise is there? What is the feel of the neighborhood? Do people speed frequently enough that it’s unsafe for kids to ride their bikes? Does the backyard flood when it rains? Are there unexpected traffic patterns that make the commute longer than you think? One way to get your answers is to find a local acquaintance who can clue you in. In 2013, when my family was PCSing to Fort Hood, I posted the street we were considering living on to my Facebook page and asked if anyone knew about the neighborhood. A friend connected me with someone who lived in the neighborhood. Her insight, combined with the information gathered via AHRN.com’s RentSmart, turned us in a different direction (and just the right home). One of the easiest ways to find yourself with unexpected issues is to make a housing decision based on old photos that don’t reflect the current condition of the home you are renting. If the photos show brand new carpets that were installed 8 years ago, your expectations are going to be considerably higher than reality can deliver. Ask when the listing images are available. If you have someone local who can walk through the property and take pictures, even better. An alternative is to ask the property manager to give you a video chat tour of the home. You can see the house and neighborhood in real time and ask questions. If you don’t have a local friend, look to other ways to protect your options. 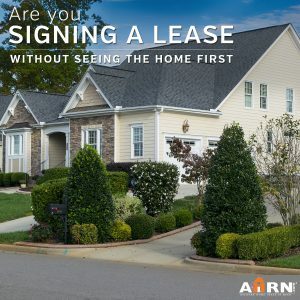 If you find a house that seems perfect, offer to pay a deposit (potentially a larger than asked for deposit) but wait to sign the lease until you arrive and view the property in person. The best homes are likely to go quickly, so be prepared to prove to the property manager that you are a serious, committed inquiry. Your rent is one of your largest monthly expenses. The home you live in can make or break your experience at an installation. Take the time to do the research needed and give yourself the best possible chance of success when searching long distance! Have you rented a home site unseen? How did it work out?